A quarterly publication of the Southeastern Division of the American Association of Geographers, Southeastern Geographer has published the academic work of geographers and other social and physical scientists since 1961. Building on its history as a regional publication, the journal publishes geographic research that engages with conditions and events in “the south,” broadly construed, as they relate to conditions and events that extend over broader geographical reaches. The journal invites scholarship highlighting the social, cultural, economic, and political diversity and broad climate and ecosystem variability that links “the south” to processes, flows, and conditions that extend across the country, continent, and globe. 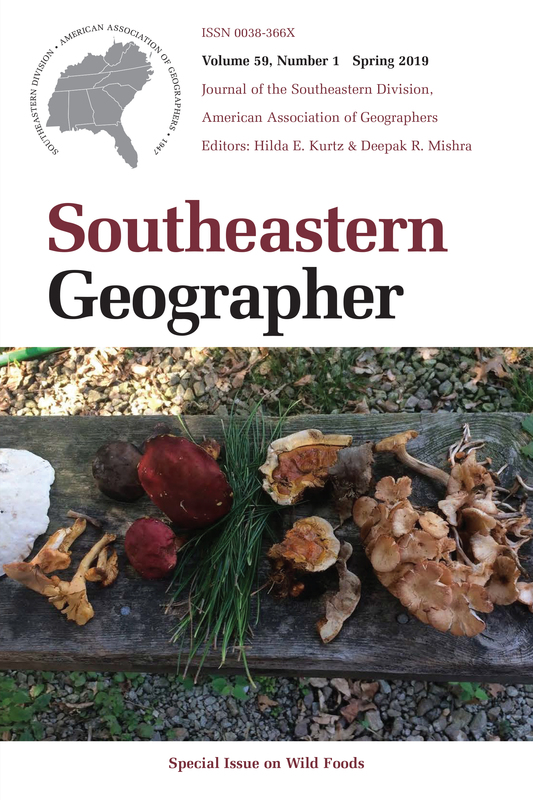 Southeastern Geographer is available both in print and digital formats. For more information on the Southeastern Division of the American Association of Geographers and Southeastern Geographer, visit www.sedaag.org. Hilda Kurtz is a professor in the Department of Geography at the University of Georgia whose work focuses on environmental justice, politics of scale, and gender and social movements. Deepak Mishra is an associate professor in the Department of Geography at the University of Georgia whose research explores the application of geospatial science, including remote sensing, GIS, and GPS, to inland and coastal environments. Southeastern Geographer is the official publication of the Southeastern Division of the American Association of Geographers. Members receive a subscription to the journal as a benefit of membership. For more information, visit the membership page on their website. No cash discounts. A 15% agency commission is allowed for recognized agencies if payment is received within 30 days of invoice date.